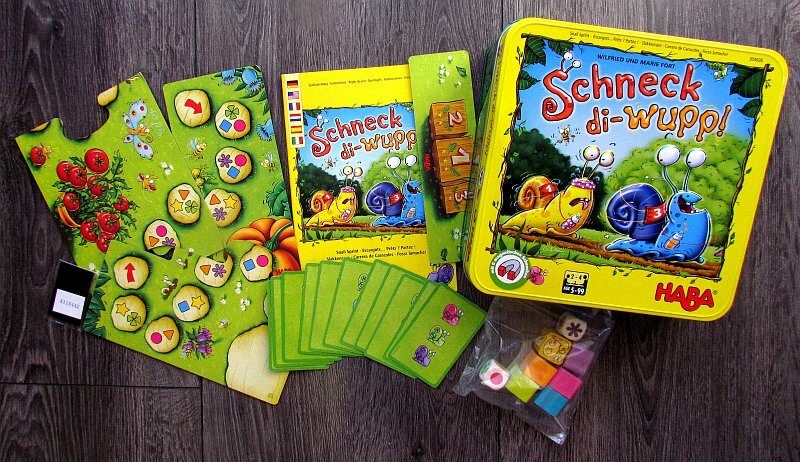 Review: Schneck di-wupp! – snail bets! My antennas are extended forward. Belly is lubricated. Houses is equipped with aerodynamic wings. 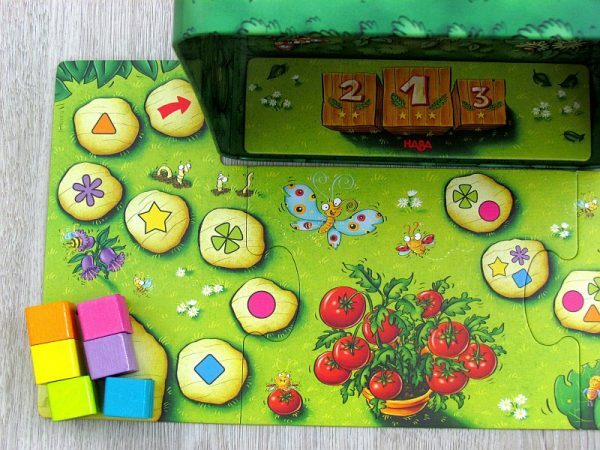 Everything is ready for the start of a unique race of snails. We hope you could even bet on your favorite! This is exactly what the players will expect from the board game Schneck di-wupp!, which is available also with English rules under the name Snail Sprint. 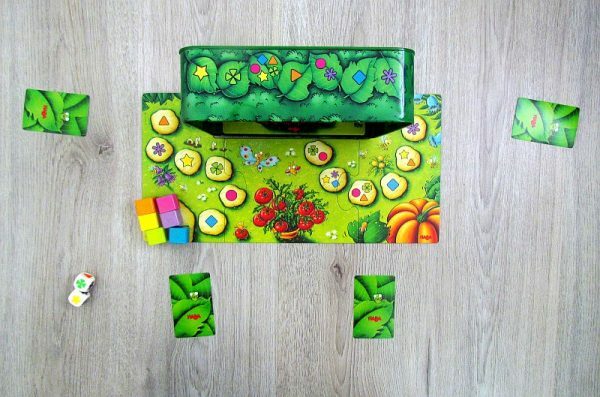 The designer’s pair is Wilfried and Marie Fort, with the illustrations arranged by Gabriela Silveira. She did not have to worry, that the snail model would run away. Unlike specially trained racing snails, this was a model snail. All this was supervised by HABA, which brings the game to market. All competitors have their home in a tin box. It serves not only as transport, but also as part of the track. This is because the snails have a magnet on their belly and can also climb the steep wall. 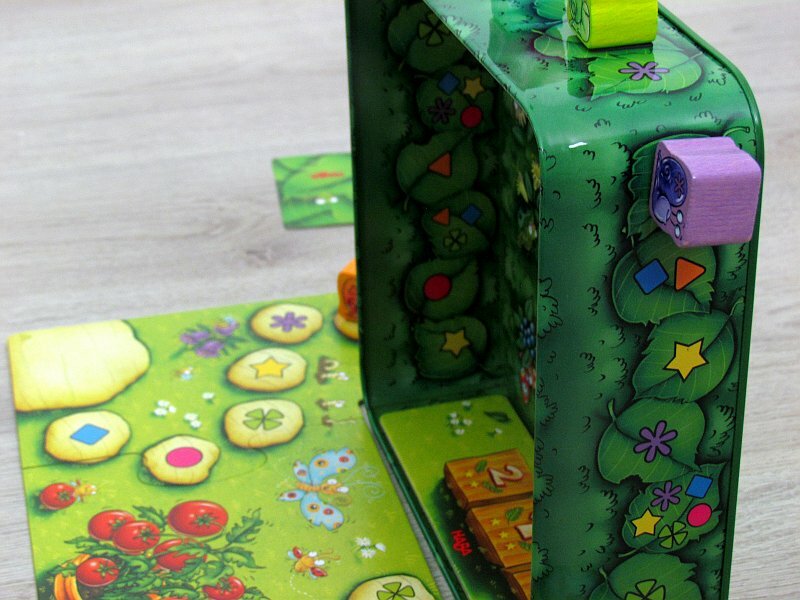 The built-in metal barrier is encircled by cardboard boards during setup, which will form a complete track together. Inside the box are space for the winners. 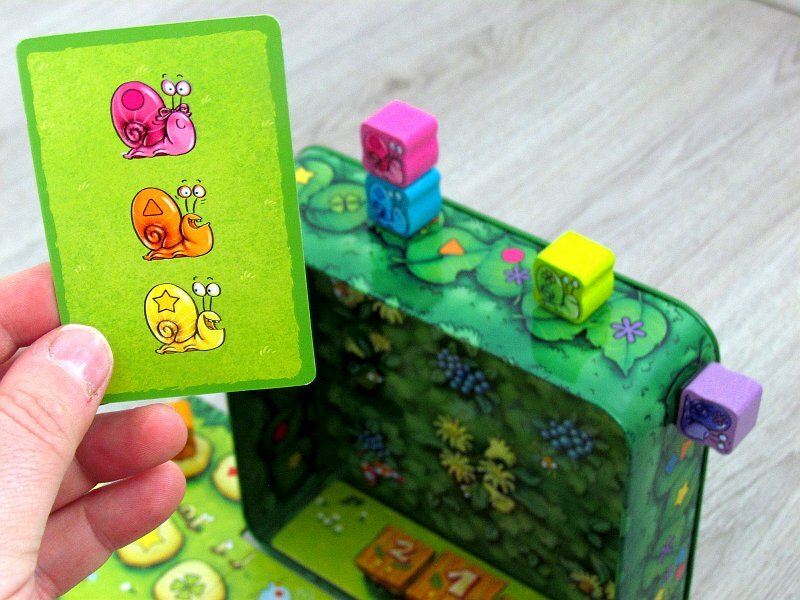 However, individual participants of this game do not get each one snail to run for them, but instead receive a random card. There is a portrait of three snails on it. It is up to the player to cheer them on. The decision to move the snail forward will also depend on coincidence. When its player’s turn, he rolls a pair of dice and two colors will usually be result of this. It is between them, that the player can decide. 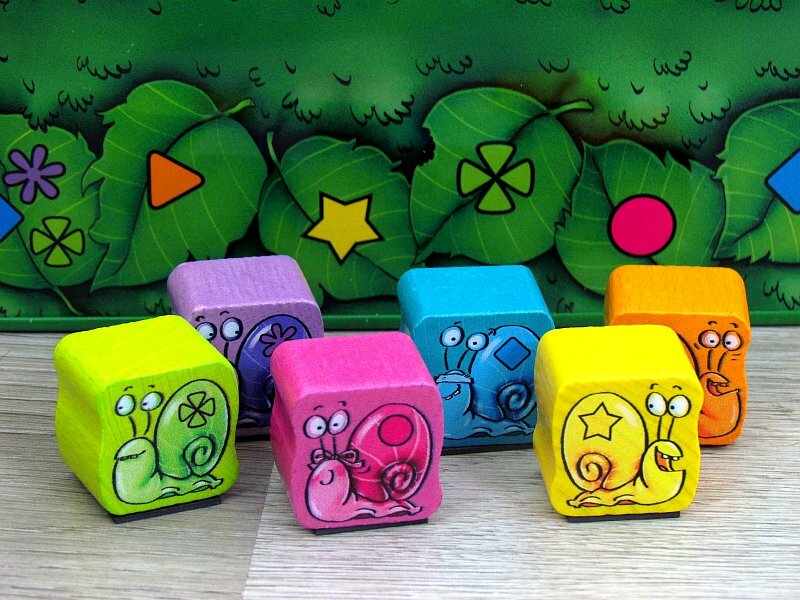 Both colors are important – while one determines the snail, that will run forward, the other marks the symbol, on which the figurine will stop. 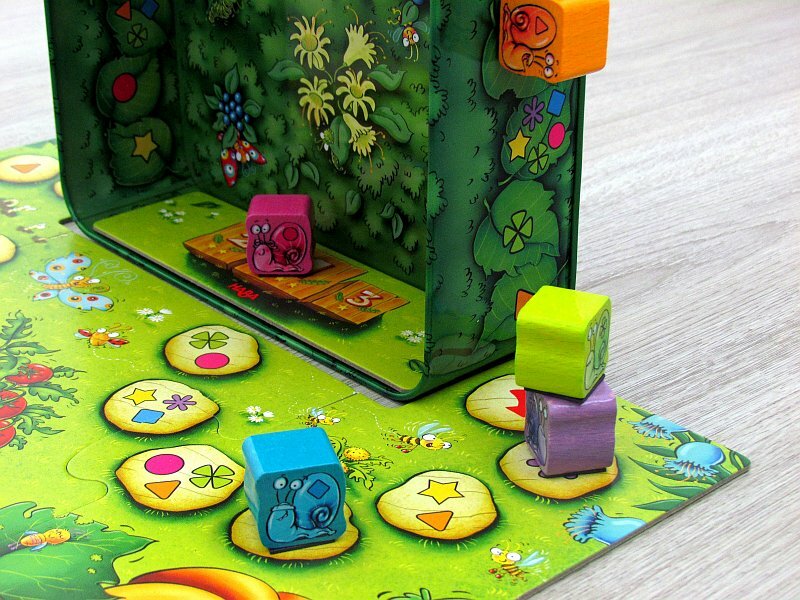 Snail will easily jump to the first free spot on the route, where that color is visible. However, when sprinting accross occupied fields, it does not mean, that another competitor can not stop there. The color of that field is replaced by the shade of the figure, that stands there and the snails can climb on his back, if he should stop here. If bottom snail moves, then he will bring a friend on his back with him. 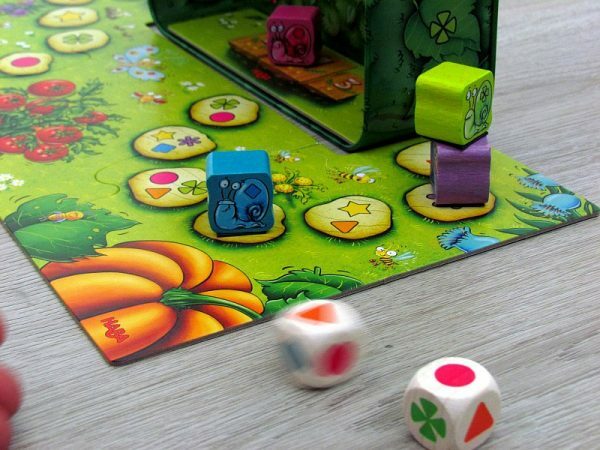 Players alternate in rolling dice and moving figures. In doing so, they must always keep their card in mind. 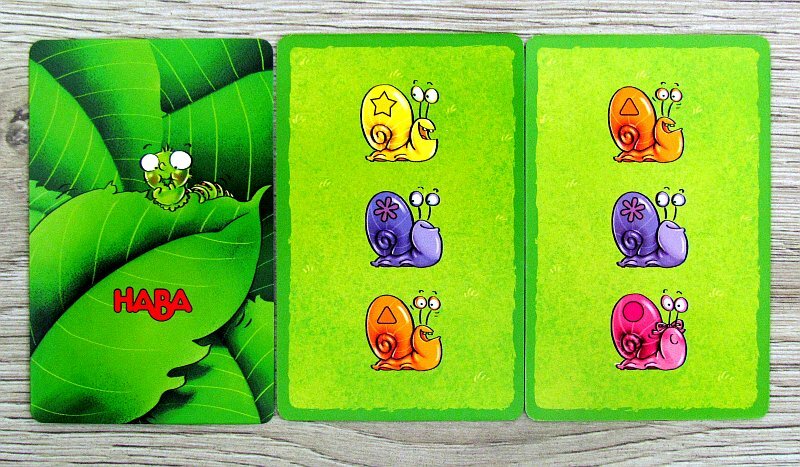 As soon as three snails have reached the finish line and occupy the winners positions, all participants will reveal their assignment cards. 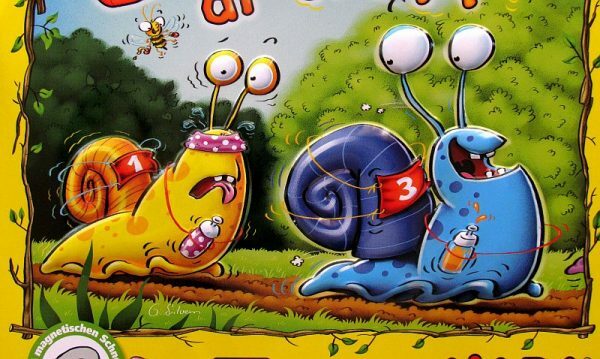 If one of the top three snails is among player’s favorites, he gets points – three for the first place, two for second and one for the third. The one, who has the most points for his colorful team is the winner. 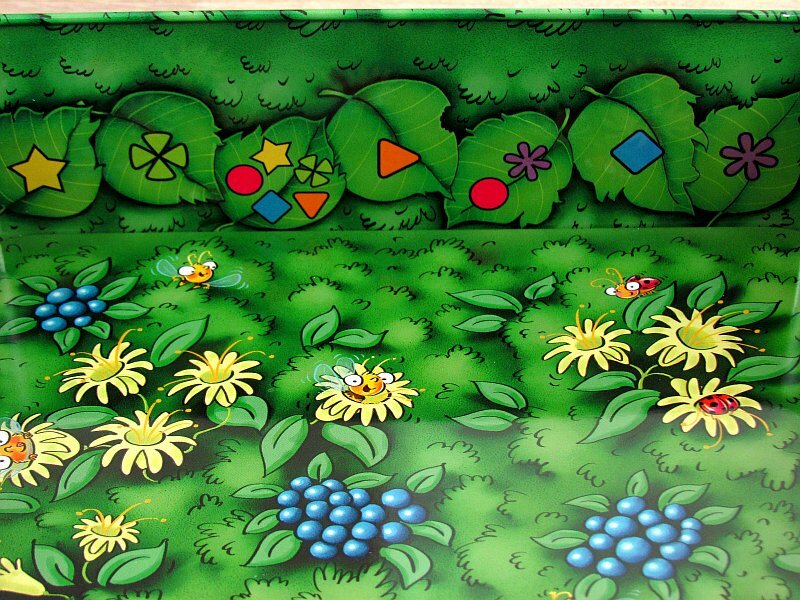 Schneck di-wupp is a combination of racing game and game of secret assignments. This is a very popular combination, that definitely is nothing original. 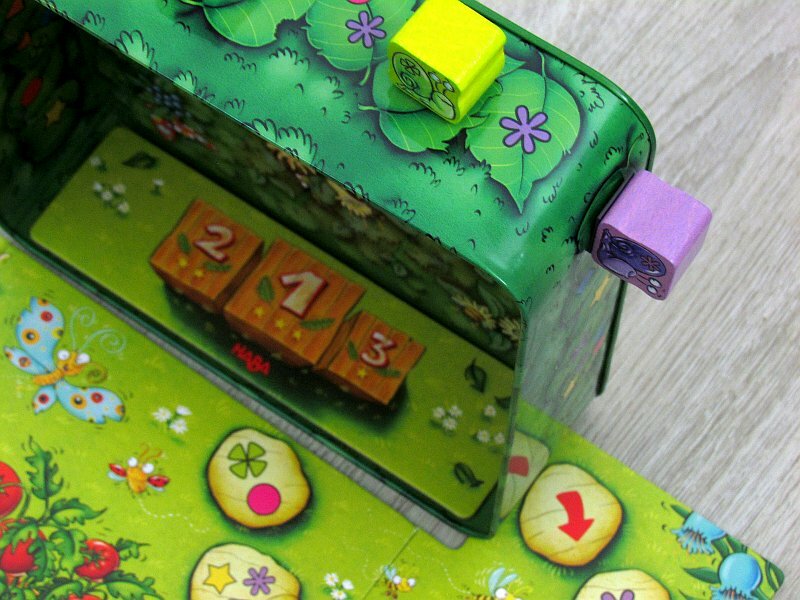 This time, however, it is packaged in a very accessible design, that has a clear task – to be tempting for children from five years up. And that’s great, because snail races are really interesting. The game is largely random. From the beginning, when identity of your racers is determined by card. This is of course also true for rolling dice, but here you may be doing favor for other participants. 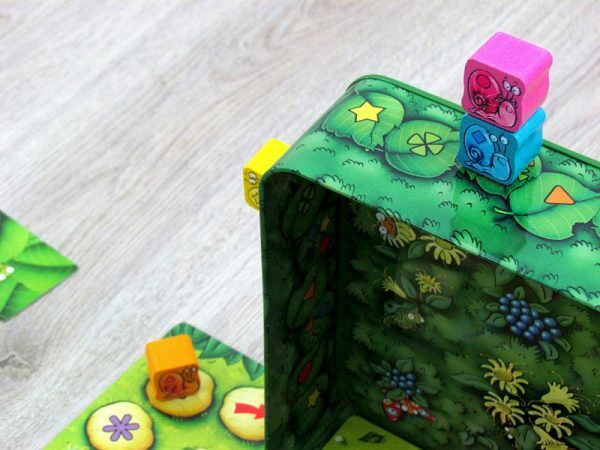 Both cubes need to be used, but it’s only up to the racer to choose usage of the colors. 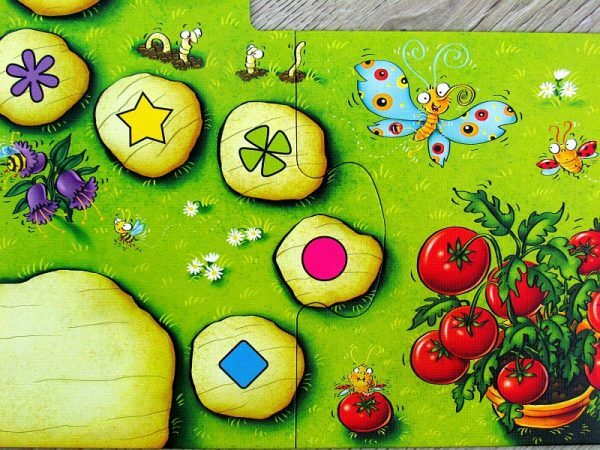 Here is an important tactical element, which is always worth appreciating with such simple children’s games. Scoring at the end of the race is clear. The player tries to get his snails in the finish line and in the best position. But more participants are interested in advancing a specific color, so there is a lot of confusion on the track. 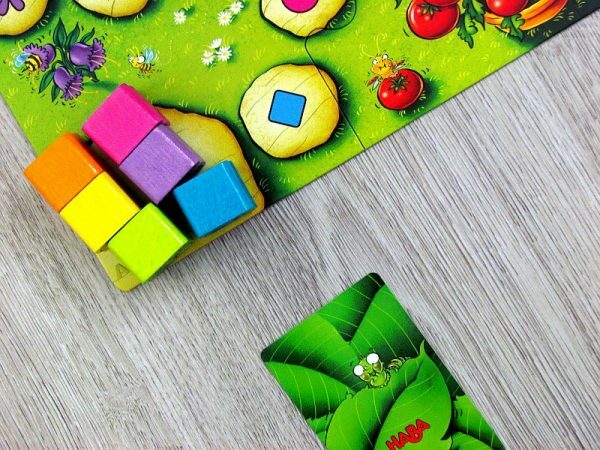 If you are watching well, it is possible to know, which colors belong to which player. 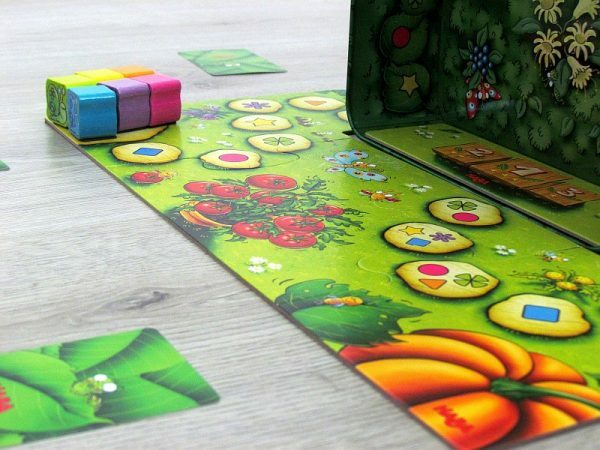 The super idea is, that the snails are climbing on their backs and serve themselves as colors. This of course applies only to straight part of the track. In addition, the boxes can be re-colored with snails to further enhance their chances of fast forward. Processing is fantastic. Wooden figures are fine, but the main star here is a metal box and magnetic snails. Racing along the perimeter, uphill and downhill, children will always enjoy it. In addition, cardboard map pieces have beautiful illustrations and everything feels very optimistic. 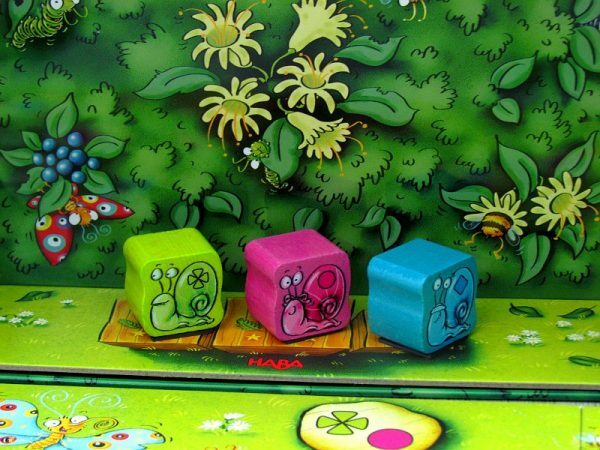 Snail Sprint is a children’s game, that even parents like to play. 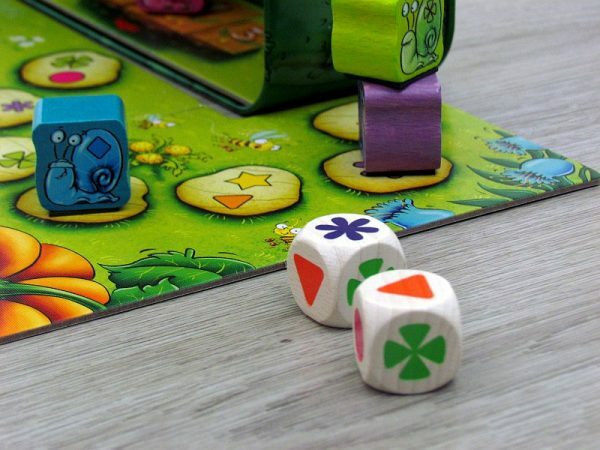 The simple racing effort is complemented by smart color choices and dice rolling. This is another game that is part of the basic children’s games, that we have to recommend (and many belong to HABA!). 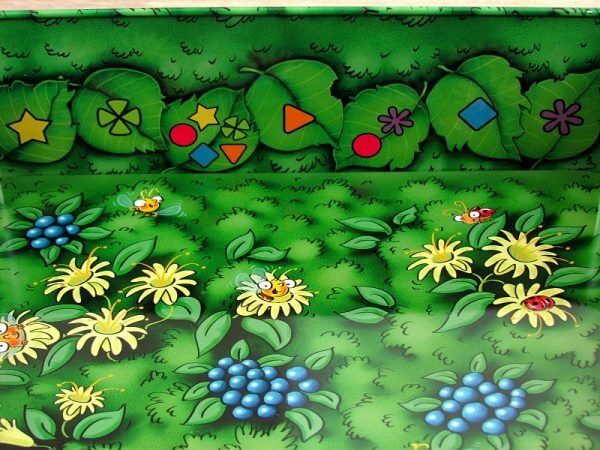 Snail Sprint is an excellent children racing game.